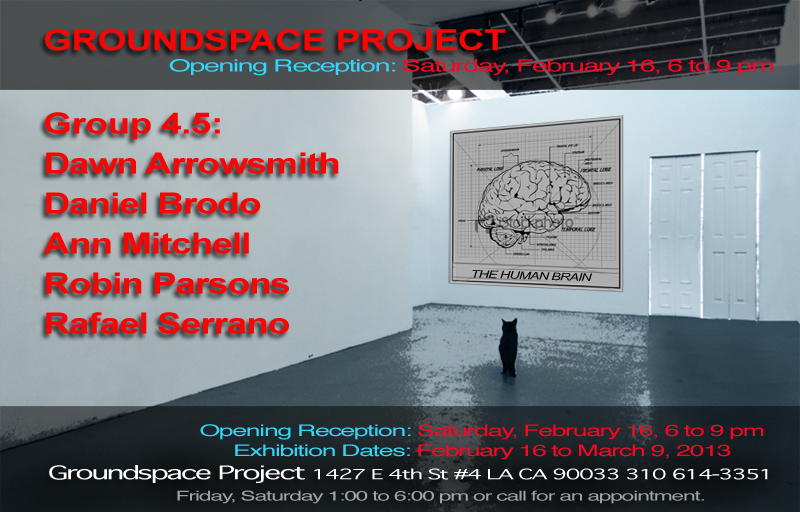 Groundspace Project is pleased to present Group 4.5: Dawn Arrowsmith, Daniel Brodo, Ann Mitchell, Robin Parsons & Rafael Serrano. Join us for the Opening Reception, Saturday, February 16 from 6:00 to 9:00 pm. Group 4.5 is the fourth in a series of exhibitions of Los Angeles based artists curated to be an unthemed collision of artists and art practices. Nevertheless, an engaging pattern of relationships has emerged, centered around painting and photography. From the traces of mild explosions to waking musings, live painting to studied contemplations, the art work in this exhibition is cerebral and sensual, and each artist passionate in their individual practice. Group 4.5 promises to be a visually striking and thought provoking exhibition. Dawn Arrowsmith’s recent paintings investigate memory and place. Mapping is the basis for interrogating a psychology of time and space, while grounded in deeply personal experience, her paintings speak to everyone. Daniel Brodo uses firecrackers to apply paint directly on the gallery wall. They are violent and chaotic events, deploying a controlled and contained firecracker blast to generate a painting. This work is a continuation of a battle between Chaos and Control that Brodo exploited in the ‘lottery ticket’ pieces. In each case, an indexical image – the true face of chaos – is left behind like a kind of thumbprint. Robin Parsons is an artist who performs live painting at various events including Burning Man. Viewers are given a special insight on the art making process by this engaging performer. At Groundspace Project, Robin will install a loop 30 feet of linen. At the Opening Reception Robin will ‘live paint,’ drawing from the energy of the audience as she works. Painter and photographer, Rafael Serrano writes, “I’m still fascinated with much of the painting produced at the turn of 20th century Europe. And what soon followed in the way of DADA and Surrealist movements. Max Earnst, Duchamp, Paul Klee and Man Ray are significant influences in me…”.